Panoramic Shot of Rachel, NV. Photo by Nic Brown. After whetting our appetites with the Area 51 exhibit at the National Atomic Testing Museum, what better way to spend our first full day in Nevada than a trip to Area 51 itself. We got off to a rather late start due to an unscheduled trip to the emergency room (expect a future blog post about what to do when you forget your meds on a trip). But, we soon set off with some handy directions from Vagabond3, a full tank of gas, sunscreen, and plenty of water. The aforementioned items should all be considered essential before you go off driving in the deserts of the Southwest. You don't know how far it might be until your next gas station, and so take lots of water with you. Since the temps were north of 100F, sunscreen and water were key. First stop was the Pilot at exit 64 off I-15. The place was heaving, clearly a last potential stop for many travelers. For some reason, our radio was tuned to a Chinese-language station and I listened to the incoherent chatter, watching people come and go. As it happened most of those stopping were continuing on I-15 and so we drove off along US-93N leaving the hustle and bustle behind. 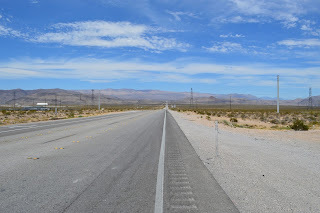 This was my and Nic's first time in the Nevada desert, and one thing that struck us over the next few days was just how different the landscape was, depending which direction we drove from Las Vegas. 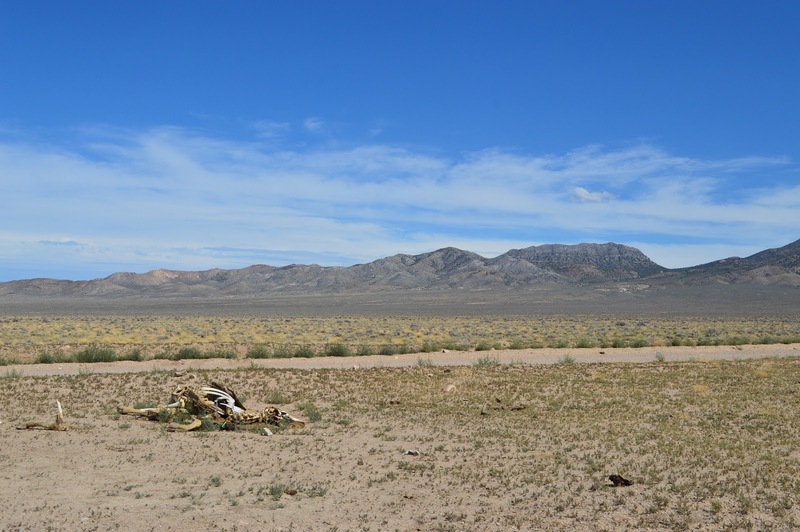 The desert north of the city looked very different from what we would see in Arizona and in Death Valley. All were similar for their sense of space. As we drove, we discussed if we would rather live in the open like this, where you could see for miles, or in the forest, where you could remain hidden but you'd have no idea who was watching you. I found myself preferring the space. Much further down the road, we made a brief stop at the Pahranagat National Wildlife Refuge Visitors Center, long enough to stretch our legs and refill our water bottles. Then it was back on the road through the isolation. 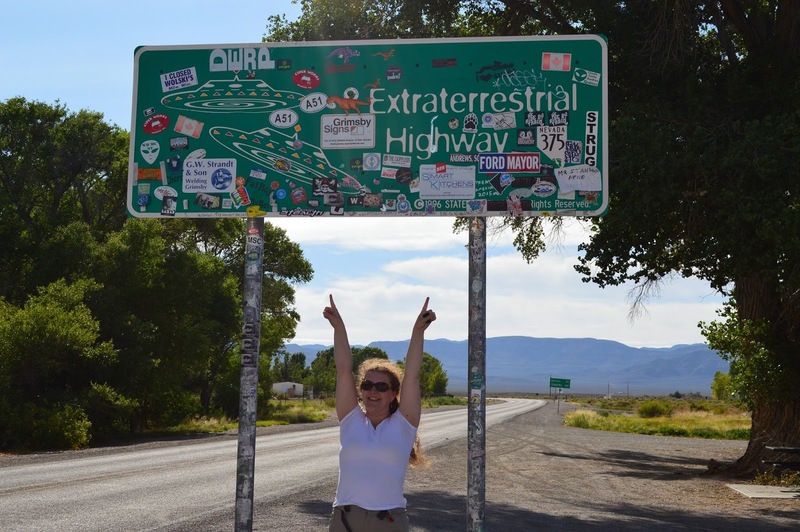 Finally, we passed through the small towns of Alamo and Ash Springs, which alerted us to our drawing close to Area 51 and the Extraterrestrial Highway. 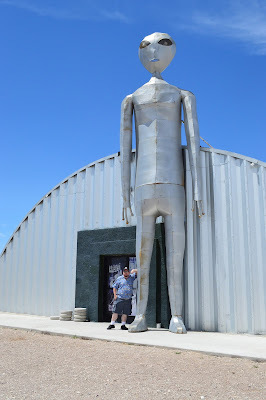 One mile further and we came to the impressive-sounding Alien Research Center. Sadly, although we had heard it was open at weekends, there was no sign of life, except for one other car of equally-disappointed tourists. We did, however, make sure to pose for the obligatory photos with our new friend. Back to more miles of lonely road. 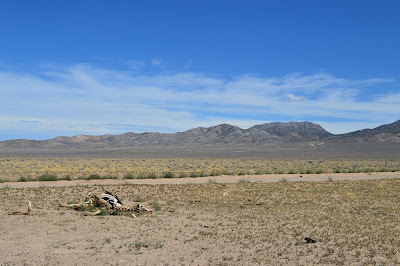 It is easy enough to see why this part of the desert is still used by the military for testing new aircraft. The flats stretch for miles and miles, providing excellent opportunities for low-flight without attracting too much attention. Since sound and light no doubt extend for miles here at night, I'm sure the area's few residents have many stories to tell. 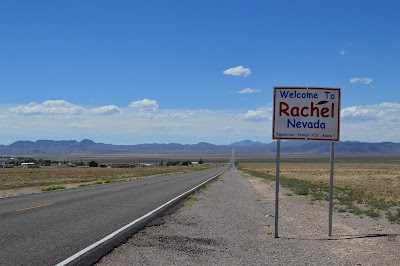 And speaking of stories to tell, we heard a few once we made it to Rachel, Nevada, home to some 98 humans. I admit I did find myself wondering what 98 people could possibly find to do in and around Rachel. My best guess is farming cattle and dodging abduction. The Little A'Le'Inn is Rachel's bar, hotel, restaurant, souvenir store, community meeting spot, and source for chatting to locals about their mysterious nearby neighbors. The walls are covered with alien and movie memorabilia, including signed photos from the cast and crew of Paul. Other displays shared photos of strange, unexplained lights, sent from around the world. Plenty here to keep you entertained. As we enjoyed our late lunch of - what else- the World Famous Alien Burger with a side of potato salad, one of the staff shared tales of the unexplained lights she had seen at night, far too high in the sky to be riders rounding up the cattle. Some new aircraft? Or visitors from another galaxy stopping by for a beer? 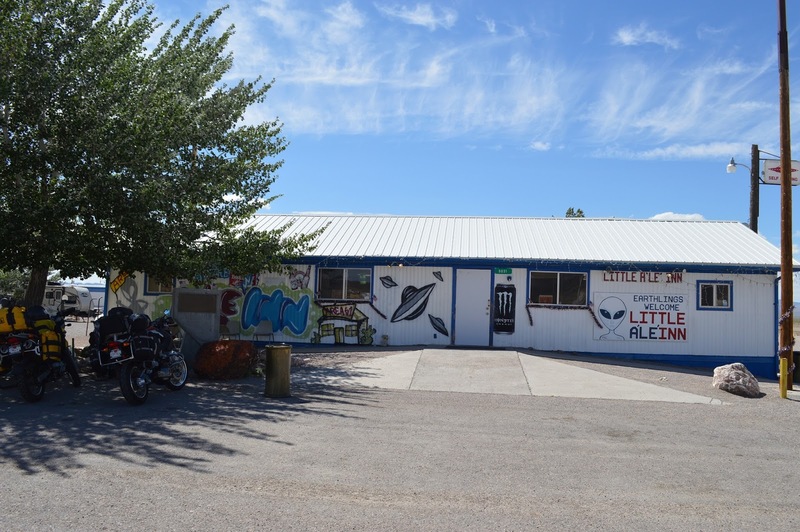 Little A'Le'Inn - the Alien Burger is delicious! What lies beyond those gates? Recharged with food, a bathroom break, and souvenir t-shirts for friends, we hit the road again. 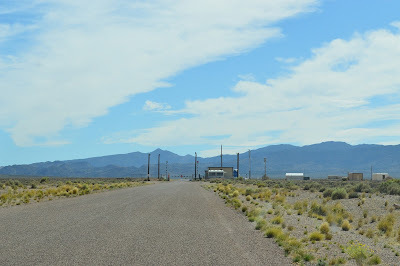 This time our destination was the back gate of Area 51. We knew that we would be stopped before we could reach the gate, and so we respectfully stopped at a reasonable distance, took photos and turned around to make our way back to Vegas. 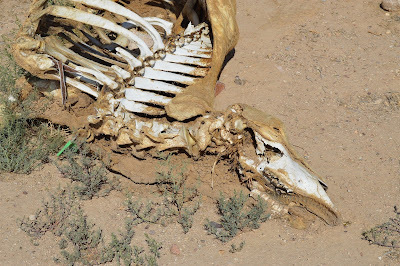 On the way, I stopped to take pics of a cow skeleton we had passed as we drove from Rachel to the gates. I was having a Georgia O'Keeffe moment so I snapped dozens of pics of bones, while Nic snapped pics of me taking pics of bones. One for the conspiracy theorists: hit by car at night or something more unworldly? If you're up on your Area 51 knowledge, you may have noticed that I haven't mentioned the Black Mailbox, mistakenly believed by many to have been the mailbox for the secret military base. I had kept an eye open for it on our way to Rachel, but having no luck, we asked at the diner. Sadly, it is no more, and this is where I have to go on a little rant. The mailbox belonged to a local resident. For more than 40 years, he had collected his mail there... until some idiots decided to break into it and open his mail. This happened several times, at one point private tax documentation being destroyed. Eventually the post office said that they would no longer deliver there. So now, thanks to the selfishness of a few jackasses who somehow thought they might find secret alien documents (?! because we all know the Government would use USPS for that! 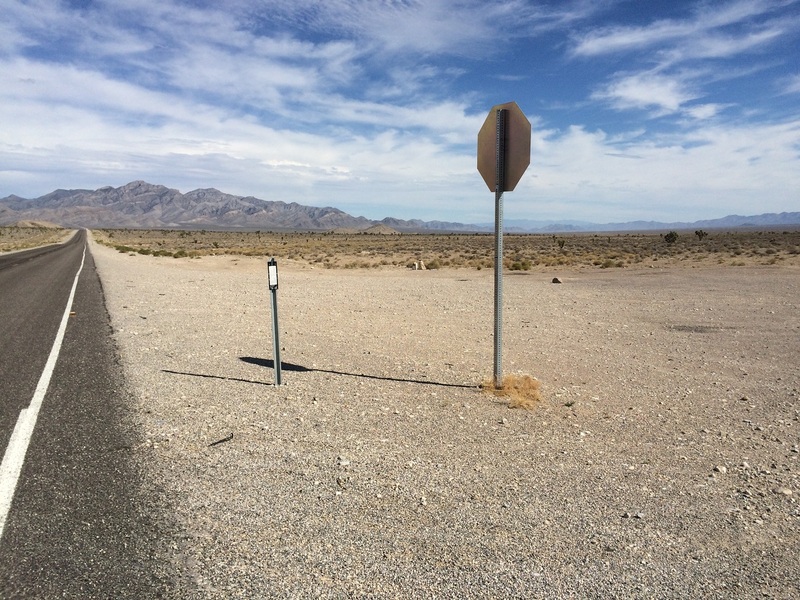 ), this poor local now has to drive to the Post Office at Alamo, a good 45 minutes away, to collect his mail. Meanwhile, a rather odd but touching little memorial has popped up where the mailbox used to be - a few rocks piled atop each other with messages scrawled on them. Paper notes are also wedged beneath the rocks, offering consolation to the man for the loss of his mailbox. The drive back to Las Vegas was rather uneventful, save for the unmarked (not even a license plate) white vans that occasionally passed us, transporting Area 51 workers back home after their shifts. Not exactly inconspicuous but better than unmarked black vehicles, I guess.